This Restaurant Is Doing Bottled Vietnamese Cold Coffee With Coconut Milk And We Love It! Ditch your South Indian filter kaapi for a swig of Vietnamese-style filter coffee and coconut milk coffee at Hanoi in Koramangala! We all love and cannot do without good old filter kaapi. 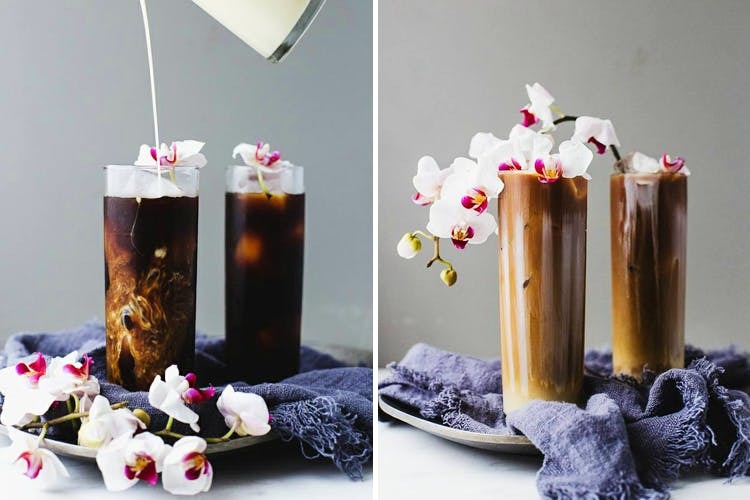 But doing a version — or rather two versions, of the filter coffee, Vietnamese restaurant Hanoi has launched fresh, made-to-order bottled coffees — a chilled filter coffee and a coconut milk coffee made out of real condensed milk. Perfect to cool off on these balmy days, and of course, to give you much needed caffeine fix to get that energy buzz. These 200ml drinks are made out of imported coffee straight out of Vietnam, so it’s got a distinct flavour. Don’t expect your Coorg or Chickmagalur taste! Currently available at the restaurant, or Swiggy and Zomato if you like in or around Koramangala, the coconut coffee costs INR 185 adn the filter one is priced at INR 175. For the best quality though, I recommend you have it fresh at Hanoi itself! While the filter coffee can be stored in a refrigerator for up to 15 days, the coconut coffee only has 24 hour shelf life, under refrigeration. So don’t stock. Just gulp!